It's one of my family's traditions to have Alaskan King Crab Legs on our holiday table. We try to have at least a poultry, beef, ham and seafood dish on the table, with the crab legs representing seafood. They may look intimidating to cook but it really is easier than you think in the Instant Pot! Place steamer basket into IP with 1 cup of water and salt. Add half of the Alaskan King Crab Legs. Press MANUAL and adjust the time to 4 minutes on HIGH pressure. Once at pressure, the display will reflect 4 (the number of minutes you initially set) and will begin to countdown to 0 minutes. When the IP beeps after pressure cooking for 4 minutes, turn the setting on top of your IP to VENTING. Doing so allows the IP to quickly release any remaining pressure (also known as QPR or QR). I use a wooden spoon to carefully turn the setting to avoid close contact with the potential steam. You may also want to turn your IP away from cabinets to allow the released steam to escape freely. The pin at the top of your IP will drop when all pressure has been released and it's safe to open. 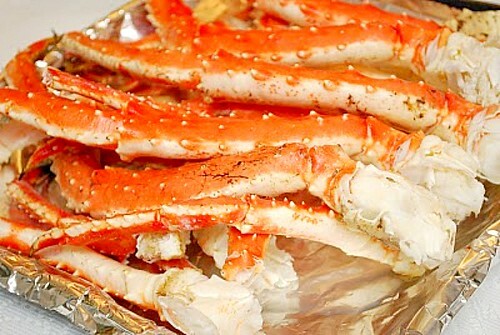 Remove crab legs and serve with melted butter. Repeat process with remaining half of crab legs.